No Facebook? In India, A New Option For Mobile Users : All Tech Considered Not everyone in the world is on Facebook, it just seems that way. Most Indians only have cheap, basic cellphones. But a company in India has figured out a low-tech means of creating a social network for the country's 500 million mobile phone users. 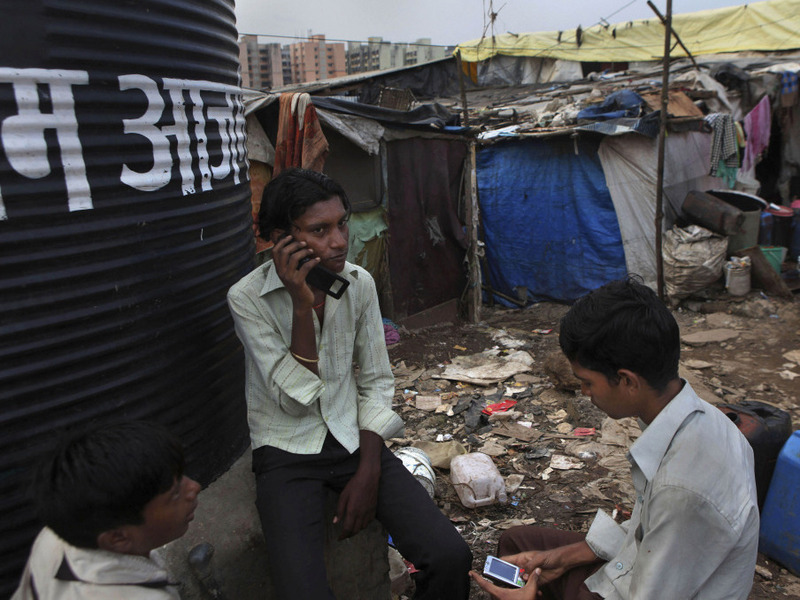 Boys in a Mumbai slum use their cell phones. An Indian service called GupShup is using simple texting functions to form virtual communities. There are vast stretches of India and elsewhere in the developing world with ample basic cellphone service, but that have yet to access social networking platforms like Facebook and Twitter. If it seems that most of the world is already on Facebook -- or soon will be -- it may be time for a reality check. There are still vast stretches of the developing world where friends aren't friended and tweets aren't tweeted, if only because people don't have access to computers. One company in India is trying to bring the advantages of social media to people on the platform they do have -- their cell phones. The company is called SMS GupShup (it rhymes with cup) -- it's the Hindi word for "chit-chat." It uses simple phone texting to allow people to form virtual communities. Most Indian cities are well-wired for the Internet -- after all, they're home of the ubiquitous call centers. But that doesn't mean that most Indians have access to computers. What they do have are cheap, basic cell phones, the kind that can only call and text. And because texts cost about a penny a pop -- far cheaper than calling -- Indians text like teenagers in a high-school study hall. Vishy Ramachandran, one of the co-founders of GupShup, says he and his partners were originally trying to create applications for fancier devices such as smart phones, but found that the real challenge was to do something with phones that weren't so smart. They created a service that allows individuals and companies to send free bulk text messages to people who request them -- groups of friends, say, or sports fans (cricket is the big one here), or commuters who want traffic updates. Ramachandran says the idea went viral. "After a few weeks of starting GupShup, we realized that the product was growing at around 1 to 2 percent per day in terms of its usage ...and that kind of gave us the feeling that we were on to something that was going to become huge." Huge, in that India alone is thought to have as many as 500 million mobile phone users, versus some 50 or 60 million people who use the Internet. The service isn't "free" free. You get content, but you also get some ads. Ramachandran says SMS GupShup is working hard to limit the number of ads and avoid becoming a funnel for spam. Pradeep Chopra is a social media analyst whose company, Digital Vidya, teaches marketers and other businesses how to use social media. He says the challenge for text-based companies like GupShup is to make their services more interactive, so users aren't just receiving, but responding. "Social media is all about giving control to others, I think SMS GupShup or this world of SMS here -- I think that real value lies in creating collaboration." Ramachandran says the company is introducing ways to let individuals do more talking to the group. So far, he says, SMS GupShup has about 40 million members in India and other countries such as the Philippines, and it's growing at a rate of around a million a month.